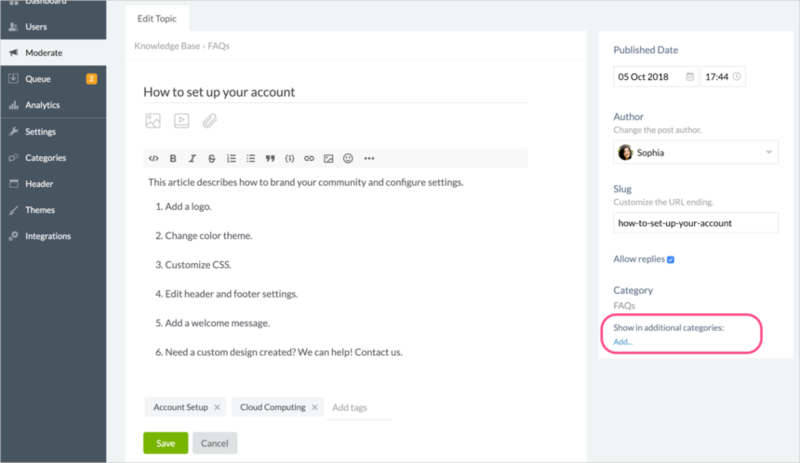 With this cross-posting feature, you can configure a single article (topic) to appear in multiple categories. This can help users find relevant content. For example, users may be looking for information about "How to create an account" in either a "FAQs" category or a "Getting Started" category. You can configure the article to appear in both of those categories. Note: Only a single copy of the article exists. Any edits, settings, or replies will be applied to this article. In the Admin > Moderate area, create or edit a topic. In the side column under Show in additional categories, click Add and select the additional categories it should be added to. Then click Save to apply your changes. The topic will be listed in each of the categories you have selected. If the primary category of the topic is private, users without access to that category will not be able to view the topic. Check that the primary category is accessible to the appropriate users. Topic settings such as pinned and topic order position will apply in all categories the topic has been added to. A topic's primary category can be changed by moving the topic using the Cog icon.